One-piece, blow molded seat; durable, rust-proof aluminum frame. Ergonomically positioned holes allow constant draining. 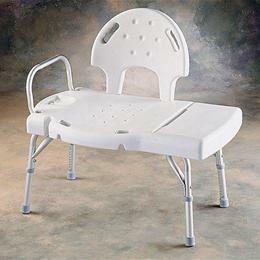 Convenient handles and hand-held shower holders molded into chair. Eight height adjustments in 1" increments. Nonslip rubber tip. Model #9681. Lifetime limited warranty. Without back, unassembled. Height adjusts: 14(3/4)" - 21(3/4)".